This is the first part of the PADI Instructor Course (PADI IDC), it takes 5 days to do your PADI Assistant Instructor course with us. 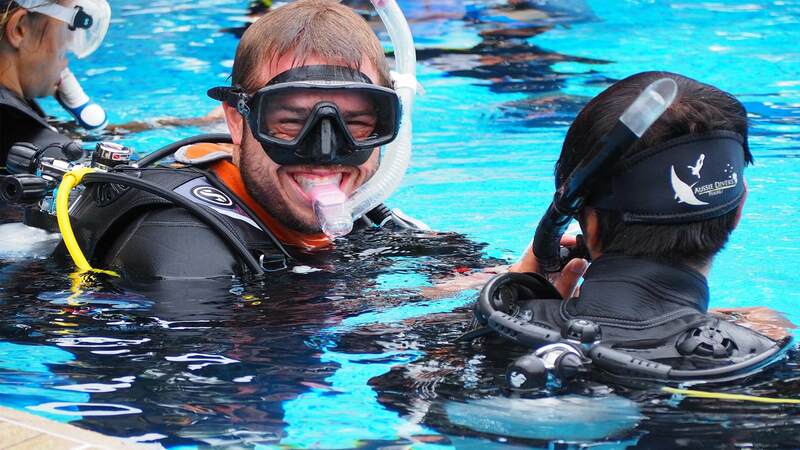 The course is conducted by our PADI Course Directors team. – Teach Peak Performance Buoyancy, Project AWARE and Coral Reef Conservation specialties under the direction of a PADI Instructor. – Independently conduct Discover Scuba Diving in a pool or confined water. – Independently conduct PADI Seal Team AquaMissions. – Independently conduct Bubblemaker programs. Another objectives as a PADI Assistant Instructor it’s to function as instructional assistants and independently conduct certain PADI programs. 1. PADI Divemaster, or leadership level with another diver training organization. 3. 60 logged dives; documented experience in night diving, deep diving and underwater navigation. 7. If not a PADI Divemaster, complete the PADI Divemaster course dive rescue assessment and submit documentation of qualifying certifications for entry level, advanced, rescue and leadership level to PADI. It takes 5 days to do the course, to follow the PADI Assistant Instructor Course you need the PADI IDC crew pack. You can use the same crewpack for the PADI IDC. Finding work after becoming a Scuba Diving Instructor can sometimes be a daunting task, you are competing against people with much more experience who have been working in the industry longer. The best thing about doing your Instructor Course in Phuket is that there is almost always work for new instructors and Aussie Divers will help you to get it. We have awesome and varied post graduation programs, ranging from 'Ride Alongs' with our elite instructors to instructor internships where experience & responsibility can be had in real world environments with real customers, getting you the qualifications & certifications you need to be attractive to employers. The absolute best way to ensure employability after you graduate to a fully fledged (OWSI) Open Water Scuba Diving Instructor is to continue your training with PADI, especially when it comes to the PADI instructor specialties we teach here at Aussie Divers. Once you have five Instructor specialties under your belt you will become an M.S.D.T or Master Scuba Diver Trainer, which looks much better on your diving resume'. Specialties include being able to teach the PADI Deep Diver (40m), Enriched Air Nitrox, PADI Wreck Diver, Sidemount Diver, Digital Underwater Photographer courses, plus many many more!